HAMPTON, Va. (January 23, 2019)– This ten-composition production written for three performers features music of Franz Schubert, Felix Mendelssohn, Hezekiah Butterworth, Giacomo Puccini, Gabriel Fauré; Hayes’s arrangements of traditional American spirituals; and libretto by Virginia Opera Community Outreach Director, Dr. Glenn Winters. This event takes place on Thursday, January 24, 2019 at 6:30 pm in the Hampton University Armstrong Hall Little Theatre. "Roland Hayes: A Life in Song," is a ten-composition production which highlights a host of musical genres—from opera and art song to cantata, oratorio and traditional spiritual—and represents the latest initiative in Virginia Opera’s ongoing educational outreach efforts to foster and enhance the enjoyment of the operatic art form through fun, engaging, compact in-school and community performances, with each program featuring fully staged performances by Virginia Opera Herndon Foundation Emerging Artists Program singers. 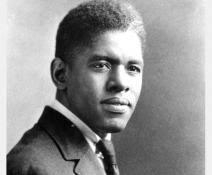 Written for two singing actors (tenor and soprano) and pianist, "Roland Hayes: A Life in Song" focuses on the compelling story of African-Amrican lyric tenor, arranger/composer, and concert artist Roland Hayes (1887-1977), now widely recognized as the first African American male to achieve popular recognition and critical acclaim for his vocal performances on the international stage—making him one of the most globally recognized singers of the early twentieth century. "Roland Hayes: A Life in Song" is directed by Dr. Karen Turner Ward, Professor and Chair of the Hampton University Department of Fine and Performing Arts. Virginia Opera President and CEO, Russell P. Allen: "Once again, I am very pleased to introduce a thoughtful and vital production that embodies this essential Virginia Opera perennial educational initiative, and brings the art form to which we dedicate ourselves to the forefront in its possibility to make a difference in the development of children through innovative musical experiences of live performance." Steven D. Myles – A nuanced communicator, American tenor Steven D. Myles has received praise for his “suave and heartfelt phrasing” and “ringing high notes, powerful enunciation” by The Boston Musical Intelligencer and Boston Classical Review. As a member of Virginia Opera’s Herndon Foundation Emerging Artists Program for the 2018-2019 season, Steven performs in a newly composed work based on the life of early 20th-Century tenor Roland Hayes, in addition to covering the roles of Sam in Kurt Weill’s Street Scene and Pinkerton in Puccini's "Madama Butterfly." Previous residencies include The Glimmerglass Festival, Utah Festival Opera, American Singers’ Opera Project and Opera in the Ozarks at Inspiration Point. Mr. Myles received his Graduate Performance Diploma in Opera from The Boston Conservatory, and his MM and BM in Vocal Performance from The University of Central Oklahoma. Symone Harcum – Soprano Symone Harcum is the 2018 first place winner of the NSAL-DC Dorothy Lincoln-Smith Voice Competition and the Sylvia Green Voice Competition. In the summer of 2018 she performed the role of Bea in Opera Maine’s production of "Three Decembers," and this past spring, Symone performed the role of Krystyna Zywulska in "Out of Darkness: Two Remain," under the direction of composer Jake Heggie and librettist Gene Scheer. Her other roles include Gertrude (the mother) in Humperdinck’s "Hänsel und Gretel" with Peabody Opera and La Ciesca in "Gianni Schicchi" with Tidewater Opera. Her cover roles include Countess Almaviva in "Le Nozze di Figaro" with Peabody Opera and Second Lady in "The Magic Flute" with Virginia Opera. After receiving her Bachelor’s degree in Music Education from Norfolk State University in 2012, she performed regularly in the Virginia Opera chorus, in addition to serving as choral director of Ruffner Academy Middle School of Norfolk Public Schools until 2016. As a member of Virginia Opera's Herndon Foundation Emerging Artists Program for the 2018-2019 season, Symone performs the soprano role in the fully staged "Celebrating African American Musicians" Series Education & Outreach tour: "The Roland Hayes Story." Symone recently received her Master of Music degree from Peabody Conservatory at John’s Hopkins University and studies in the studio of Denyce Graves and Margaret Baroody. Seth King-Gengler – Wisconsin native Seth King-Gengler is a collaborative pianist, music director, and teacher. He started accompanying as a student at Lawrence University, notably serving as pianist for the university's opera productions. For his efforts in accompanying, he was awarded with the Marjory Irvin Prize. Upon graduation, Seth represented Lawrence at The Gilmore Keyboard Festival. He then served as staff pianist for College Light Opera Company's 2016 season, bandleader for University of Memphis' production of "Little Shop of Horrors," music directing "Crazy for You" and "Legally Blonde" with Young People's Theater, and performed for several operetta and musical theater productions in the SE Michigan area. Currently residing in Chicago, Seth frequently freelances in a variety of settings, and serves on faculty at Saint Xavier University. As a member of Virginia Opera’s Herndon Foundation Emerging Artists Program in the 2018-2019 season, Seth is the pianist and musical director for the fully-staged education production of "The Roland Hayes Story – A Life in Song." Karen Turner Ward (Stage Director) – Professor and Chair of the Department of Fine and Performing Arts at Hampton University, Dr. Ward holds a Bachelor of Arts Degree in Drama and African American Studies from the University of Virginia, a Master in Fine Arts Degree in Acting from Virginia Commonwealth University, and a doctorate from Regent University. On a professional CV that includes producing, directing and acting, she has produced over ninety-five productions during her tenure at Hampton University as well as selected stage direction credits that include: "What Use Are Flowers?," "The Colored Museum," "Treemonisha" (an opera), "Desire Under the Elms," "A Raisin in the Sun," "The River Niger," "The Amen Corner," "Home," "The Quiet in the Land," "Ain’t Misbehavin’," "Dream Girls," "Fences," "Raisin (The Musical)," "The Children’s Journey," "Little Shop of Horrors," "Grease," "The Wiz," and others. Dr. Ward has written three successful musicals, including: "Through the Crack," "Mama Dee’s Girls," and "A Love to Call My Own." She is currently working on the script for the second season of the popular web series, "Come Midnight." Virginia Opera Association, Inc., in its 44th Season (2018-2019), is known and respected nationwide for the identification and presentation of the finest young artists, for the musical and dramatic integrity of its productions, and for the ingenuity and variety of its education and outreach programs. Mainstage performances in three markets across the Commonwealth reach nearly 50,000 attendees annually. In March of 1994, by unanimous vote of the Virginia General Assembly, Virginia Opera was named “The Official Opera Company of the Commonwealth of Virginia” in recognition of the organization’s contribution to the state as well as to the world of opera. This event is free and open to the public. Doors open at 6:00 pm.